We build fast, affordable, responsive, mobile-ready WordPress sites that let you focus your organization or business. Our sites are secure, always backed-up and are easy for you to grow and maintain. Your brand is your business. We can help bring it to life. 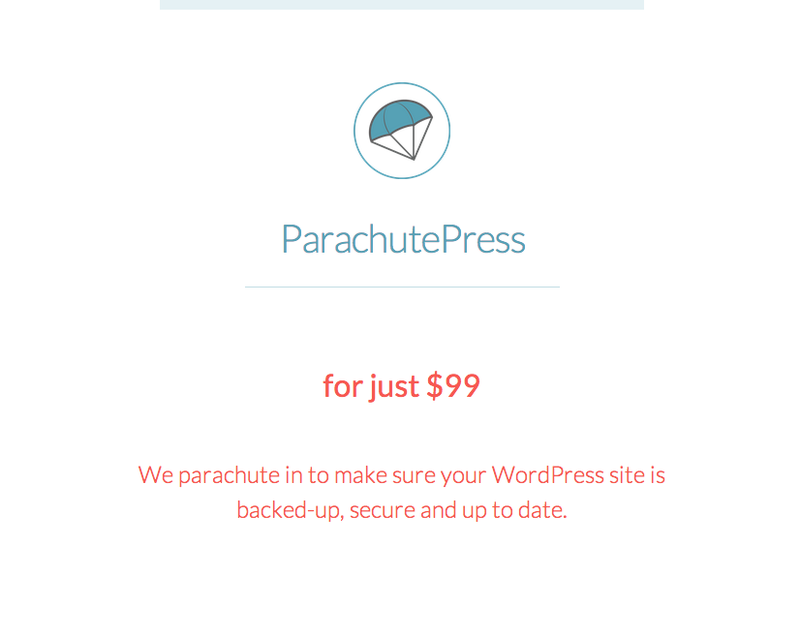 Using WordPress, we build solid, fast, responsive websites. Just a call away when you need help, so you can sleep easy at night. I've recently started working with 10up, so we're not currently taking any new projects. That said, I might be able to recommend someone for a project, so feel free to drop me a line. We work with all kinds of clients. Some are really technical and some aren’t. All of them, however, are afraid of the WordPress Update button. We regularly get emails asking us to click the update button because they don’t want to mess anything up. ParachutePress was born out of this need. We wanted a simple way to reach out to clients and their friends and offer them affordable peace of mind. Sheilagh O’Leary has been a force in the city of St. John’s for years. As city councillor and community activist, Sheilagh had a strong vision for how she saw the city unfolding. As a long-time professional photographer, she had a strong vision for how her campaign website should look, feel and behave. 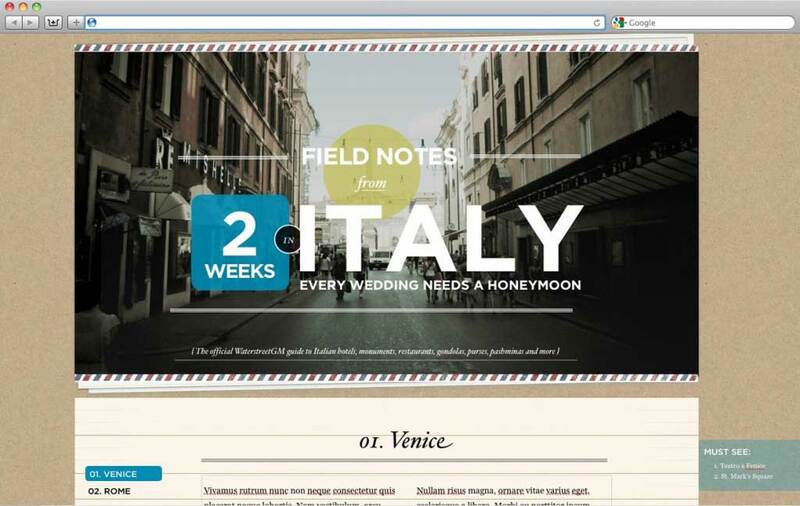 With a very tight timeline, we delivered a beautiful site that integrated perfectly with the existing campaign branding. Through the site, we were able to collect donations, engage volunteers, and distribute campaign news latest happenings. We’re extremely sad to report that the site is no longer live. 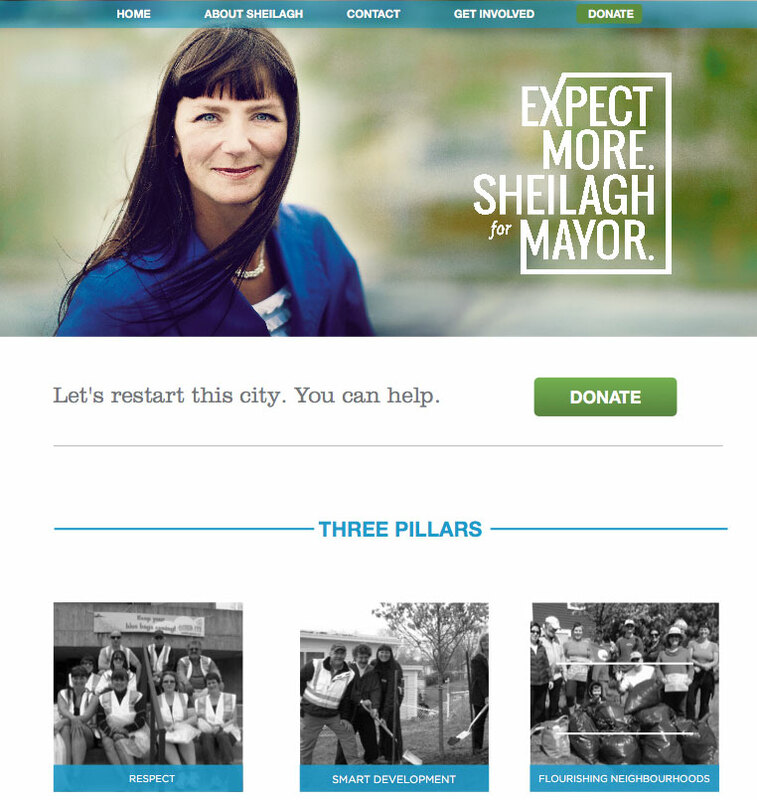 Although Sheilagh ran an admirable campaign, it wasn’t enough to unseat the incumbent mayor. Luckily though, we’ve got the site all ready and waiting for next year! 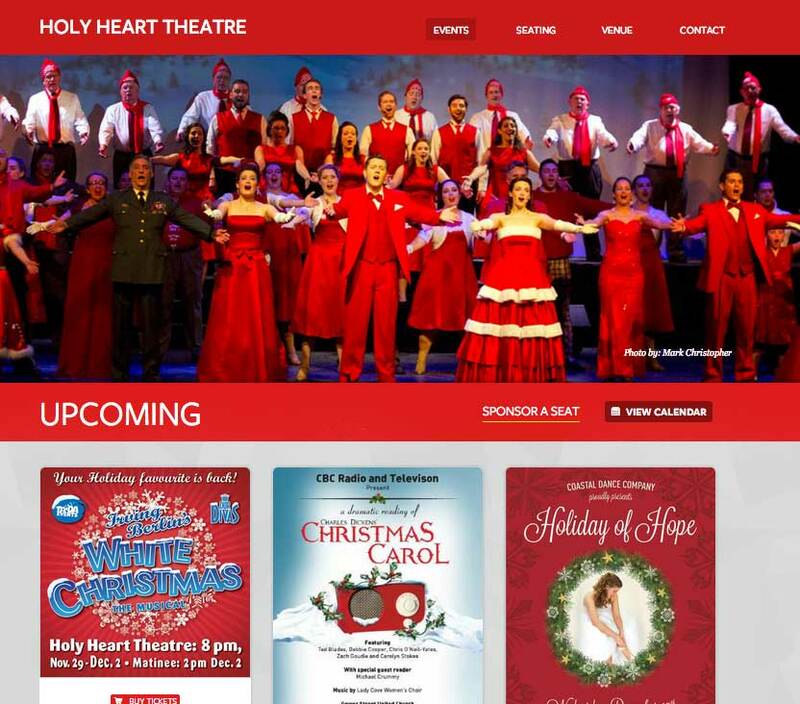 Holy Heart Theatre has been a mainstay for local concerts, recitals and plays for 50 years. The new site features lots of exciting new components. Up front, that slick scrolling action is provided by Mark Dalgleish’s Stellar.js, and the show listing is handled by the always useful jQuery Masonry from David DeSandro. Being a theatre site, promoting shows and events was at the heart of the requirements. Modern Tribe’s The Events Calendar came through as the obvious way to help manage this. The Events Calendar works perfectly right out of the box — the user creates an event, it shows up in a ‘brick’ in the masonry layout, and also gets added to a calendar view. Easy peasy. The site is fully responsive and is built with WordPress of course—as I publish this, it’s ticking along with WordPress 3.5-Beta2 which adds the exciting new media management workflow, and features my first use of the excellent Custom Field Suite. 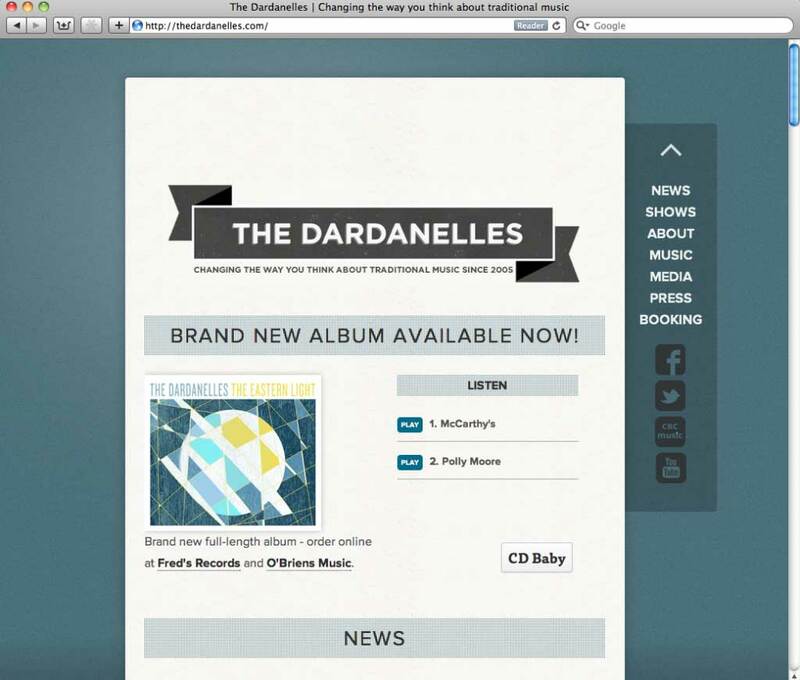 The Dardanelles have slowly been tweaking and redefining traditional music since forming in 2005. They’ve brought their energetic folk tunes, ballads and reels to audiences across Canada, the US and as far afield as Australia. I had the honour this past winter of designing and creating their internet livingroom. The site was built with WordPress and features the awesome Portfolio Slideshow Pro from MadebyRaygun, and MP3-jPlayer serves up the Flash-free audio for all you iPad surfers out there. Same as usual, I started with Victoria Park, my fork of Automattic’s Toolbox theme. Many thanks to band member and fellow designer Matthew for gently poking and prodding to make sure we yielded the best possible result. Can’t read the light text on Daring Fireball‘s dark background? Me either. And now you don’t have to. 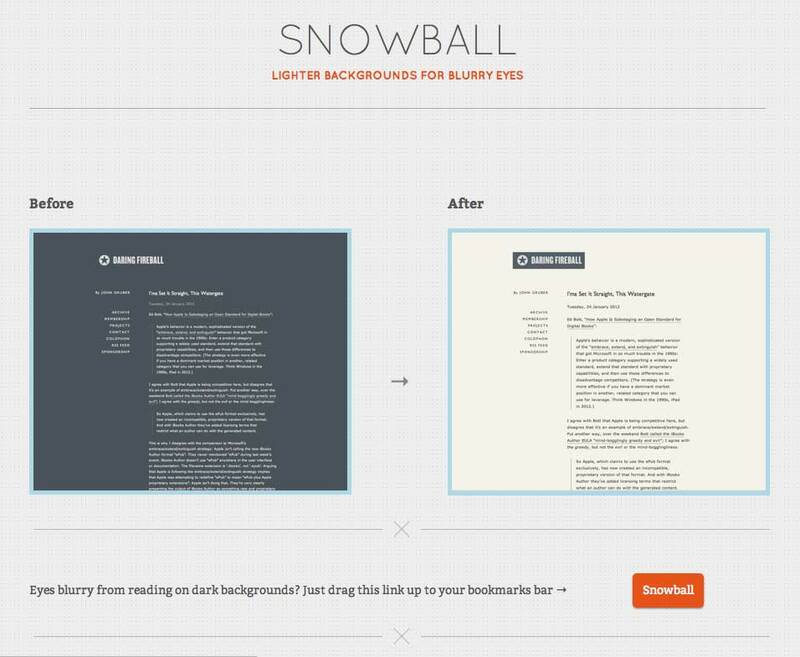 Snowball is a simple jQuery bookmarklet that tries to lighten the mood a little. It works best on Daring Fireball, but also works anywhere else on the web. Basically, it makes the text dark and the background light. Easy as that. The list of selectors is incomplete, but I’ll be adding to them as I go. If you come across a site that Snowball doesn’t work on, just send me a note and I’ll add it in. When I make a change, you won’t need to do anything. The selector will be ready to use next time you need it. 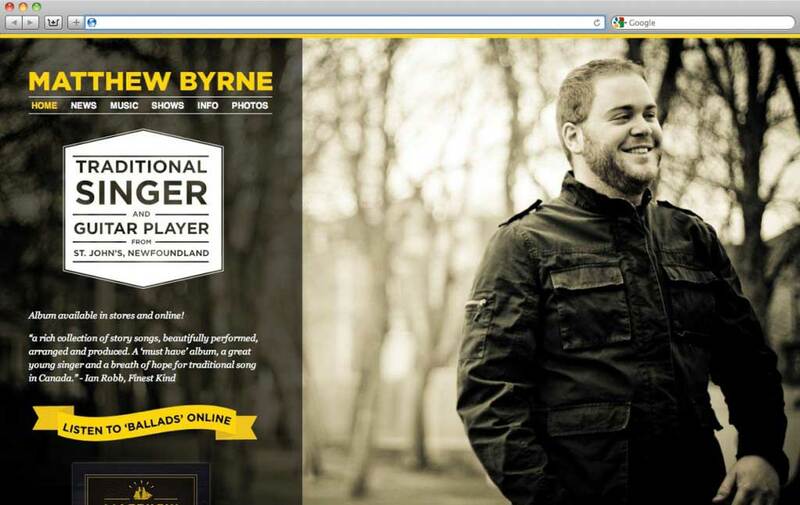 Matthew Byrne is a fantastic local musician. We worked together over the past few weeks to create a site that we hoped add a modern twist to traditional music websites. The site was made with WordPress, and features the HTML5 theme, Toolbox from Automattic, Backstretch, a jQuery plugin from Scott Robbin, and photos from me. 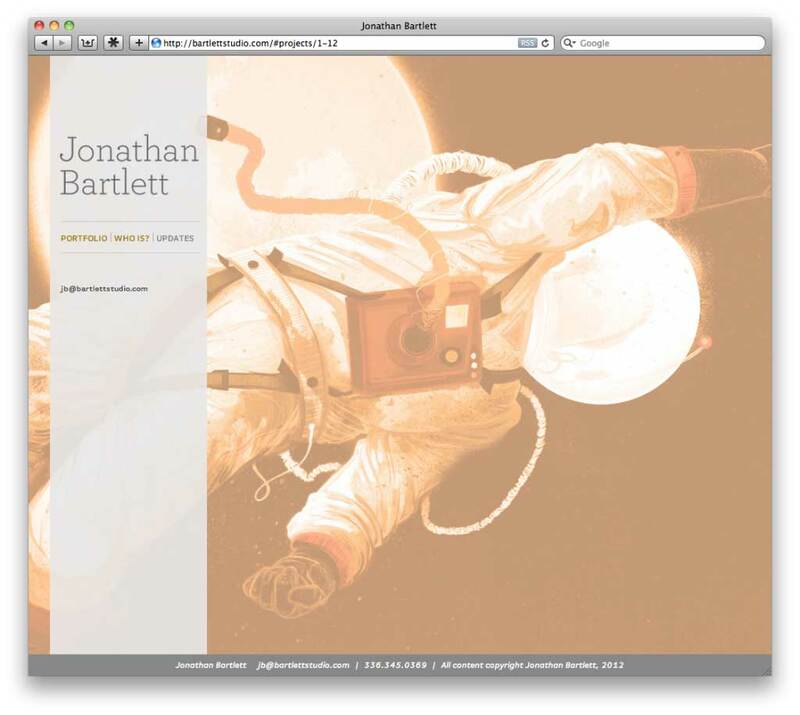 Matthew’s site was featured on Design Fridge and The Best Designs the day after it launched. If you’re unfamiliar with Matthew’s work, be sure to check out The Banks of Newfoundland—my personal favourite—on the music page. Captain Bookmarks started the day it was announced that Yahoo was closing Delicious. 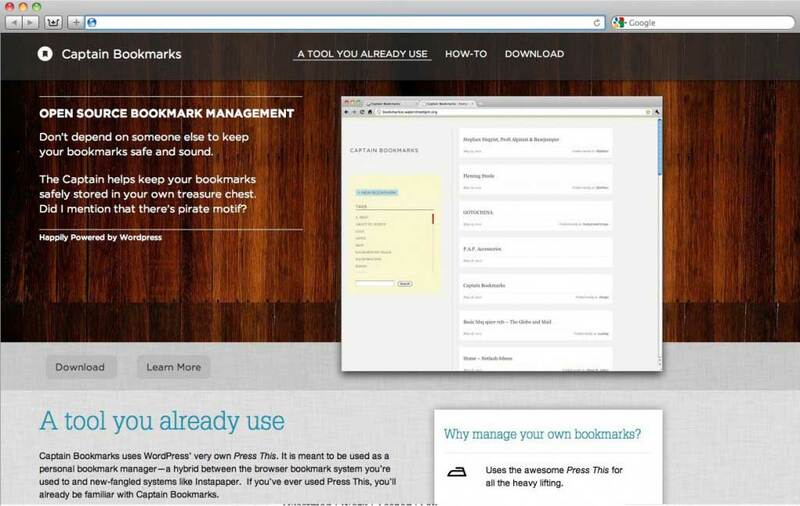 Instead of relying on fleeting 3rd parties to manage our bookmarks, I thought there was a better way: just use WordPress, a tool you already know how to use. 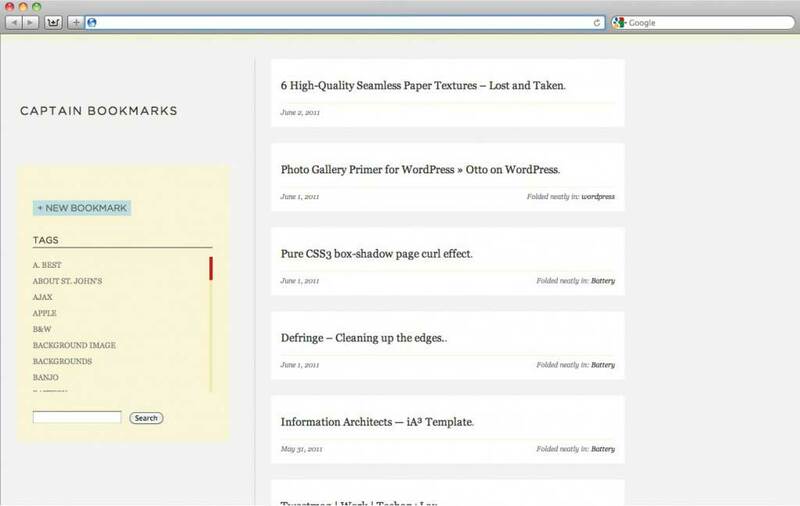 Through the Captain Bookmarks site, I’ll be releasing new themes to hold all your bookmarks! As a start, check out Treasure Island. Every wedding needs a honeymoon. Field Notes from two weeks in Italy documents the search for the perfect espresso around Venice, Florence and Rome. *Slated for release before August 6 (the 1st anniversary)! WordCamps, conferences featuring all things WordPress, are held in hundreds of places around the world—except to date in St. John’s. 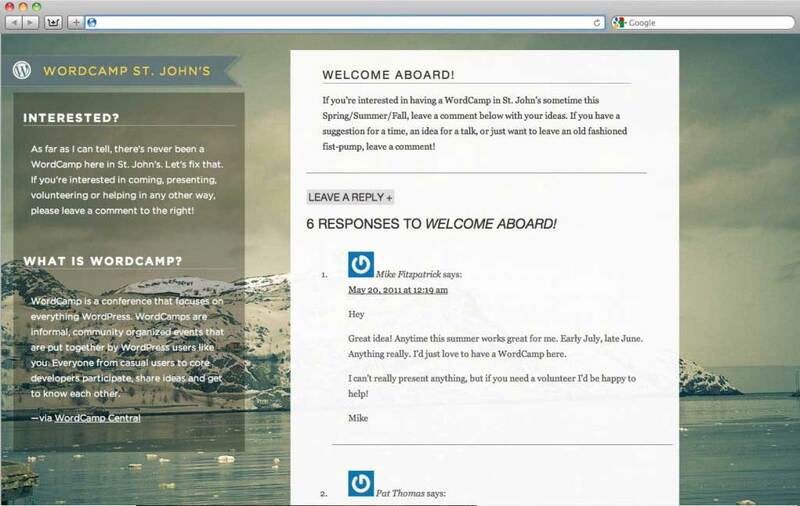 WordCamp St. John’s is an effort to change that and organize a WordCamp right here at home. In island oasis for all your bookmarks. And it’s here for you if you like what you see. See an example installation here and get the code on Github. 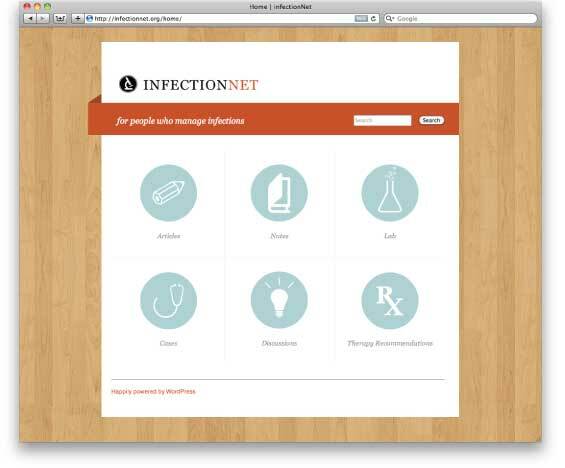 One of the world’s leading sites for people who manage infections. Antimicrobial resistance is quickly becoming one of world’s most significant healthcare problems. At infectionNet, we decided to try and do something about it. 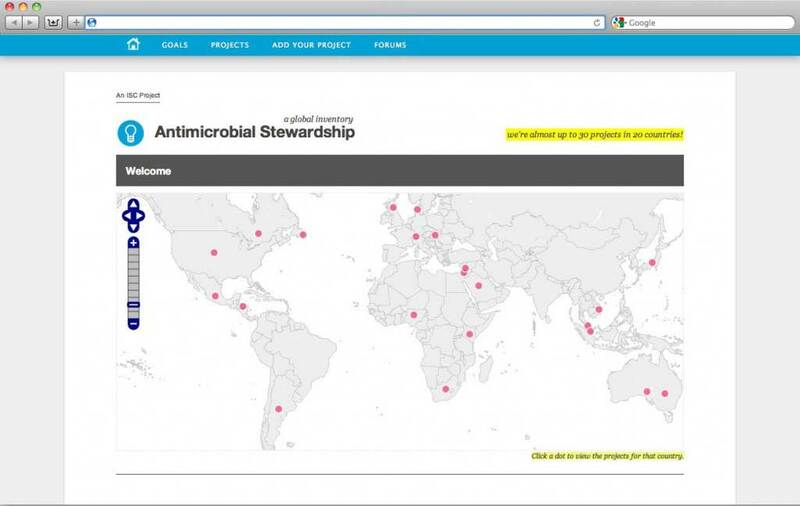 The Antimicrobial Stewardship Inventory is an attempt to highlight the work of others around the world in combating this global problem.